(1) Department of Neurosurgery, Hospitales Universitarios Virgen del Rocío y Virgen de la Macarena. Sevilla, Spain. (2) Department of Neurosurgery, Hospital General Universitario de Alicante. Alicante, Spain. (3) Department of Neurosurgery, Hospital Universitario La Fe. Valencia, Spain. (4) Department of Neurosurgery, University of Pittsburgh Medical Center. Pittsburgh, Pennsyilvania, USA. Removal of the odontoid process is a procedure often required for the treatment of a wide range of pathological entities. The transoral approach has been used extensively, but in the last decade, the expanded endonasal endoscopic approach has emerged as an alternative access to ventral skull base lesions. This first slide shows a schematic cadaveric dissection in a sagital plane of the expanded endonasal approach to the craniocervical junction. Note that the transnasal exposure provides a direct route to the odontoid along a rostral to caudal trajectory. Only a muscular and cartilaginous layer is located in between the oropharynx and the odontoid process. The procedure is initiated in the right nares with the introduction of the endoscope into a nasal vestibule through a lower trajectory. The first structures to be visualized were the nasal septum medially, the inferior turbinate and the middle turbinate laterally. The inferior margin of the middle turbinate led to the choana which represented a landmark of the approach. Resection of the tail of the inferior turbinate can be useful if the ET is not properly seen. Rosenmüller’s Fossa and ET represent the lateral limit of the dissection and an accurate view of this structures is mandatory. The pharyngeal recess (fossa of Rosenmüller) projects laterally from the posterolateral corner of the nasopharynx below the foramen lacerum. Again, just posterolatelly is located the poststyloid compartment, located behind the prestyloid part, contains the internal carotid artery, internal jugular vein, and the Cranial Nerves IX through XII. The floor of the sphenoid sinus forms the roof of the nasopharynx where the pharyngobasilar fascia attaches. In order to expose the cranio-vertebral junction, the mucosa of rhinopharynx was incised along its lateral limits at the edge with the ostia of the Eustachian tube and along the inferior wall of the sphenoid sinus superiorly. 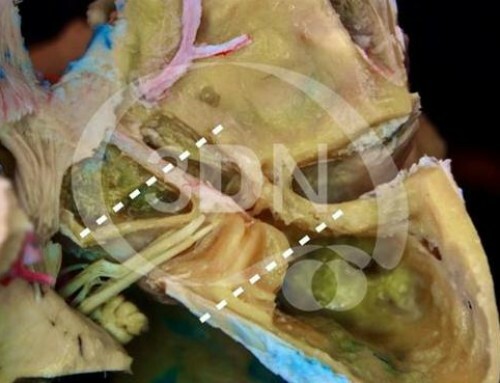 In this slide the mucosal layer and superior constrictor muscle at the posterior wall of the nasopharynx have been removed to expose the prevertebral muscles. The superior clival line is clearly seen. The inferior clivus is the place of attachment of two muscles: the longus capitis and the rectus capitis anterior. These muscles create two well-defined lines of attachment on the ventral surface of the inferior clival bone that have been denominated superior clival line (for the longus capitis) and inferior clival line (for the rectus capitis anterior). The longus capitis has been removed and the inferior clival line has been exposed. The upper portion of the foramen lacerum is occupied by the lacerum segment of the internal carotid artery (ICA), and the lower portion is composed of fibrocartilaginous tissue originating from the pharyngobasilar fascia, underlying muscles and ET attachment. 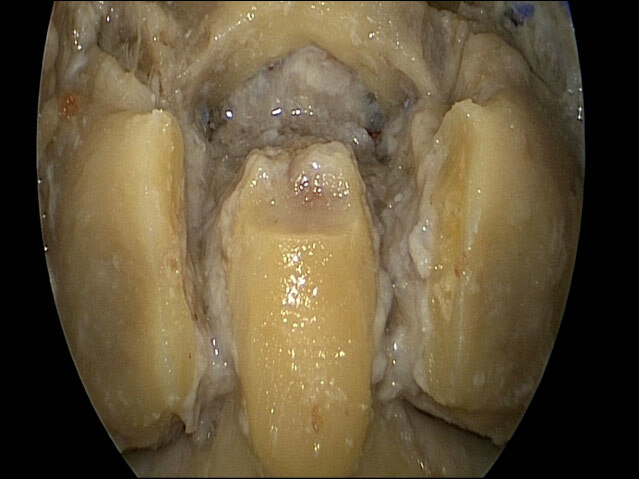 This lower portion of the foramen lacerum continues with the petroclival synchondrosis along the lateral limit of our approach. 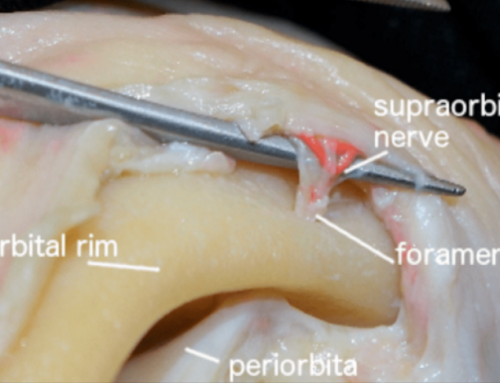 This fibro-cartilaginous tissue runs from the lower portion of foramen lacerum to the superiomedial aspect of the jugular foramen. The rectus capitis anterior muscle has been removed. The inferior clival line or supracondylar groove provides a reliable landmark for estimating the position of the hypoglossal canal and its external orifice, which are situated just posterior and lateral to the groove, respectively. The anterior atlanto-occipital membrane has been resected and the anterior ring of C1 and body of C2, the atlanto-occipital joint, and the Magnum foramen are exposed. The retropharyngeal carotid is directly posterior lateral to the eustachian tube. The styloid diaphragm, formed by the anterior part of the carotid sheath, separates the parapharyngeal space into pre- and poststyloid parts. The poststyloid compartment, located behind the prestyloid part, contains the internal carotid artery. Sometimes the styloid diaphragm is not competent and carotid artery is located unusually medial. Care should be taken to stay medial to the eustachian tube and even medial of the atlanto-occipital joint to avoid damage the carotid artery. In our disecction the medial aspect of the condyle must be the lateral under the petroclival synchondrosis in the odontoid process approach. Further exposition is achievable but if the dissection is extended more lateral the hypoglossal nerve may be damaged. The supracondylar groove and the lateral pharyngeal tubercle provides a reliable landmark for estimating the position of the hypoglossal, but in this approach is not necessary that much lateral exposure. 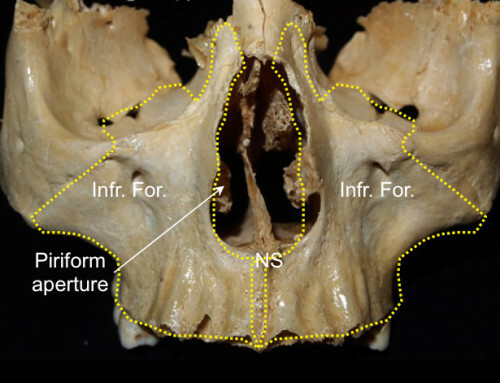 The key anatomic boundaries within the fossa of Rossenmueller and critical anatomic landmarks are: Both ET, both condyles and atlanto-occipital joint, anterior arch of C1, inferior clivus and Mangum foramen. 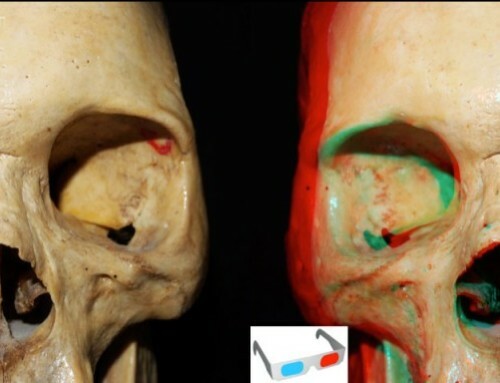 After exposure, the anterior arch of the atlas can be removed using a combination of high speed drill, ultrasonic aspiration, and standard Kerrison rongeurs. The safety zone for our drill is between both condyles. The medial aspect of the atlanto-occipital joint is an easy landmark to get orientation. The dens now can be followed from its origin at the body of C2 to its. The apical ligament has been cut and the vertical portion of the Cruciform ligament transected can be obsereved above the dens. The site and severity of the compression will determine the extent of the dens that will need to be exposed and removed. In turn this will determine how much of the overlying ring of C1 that will need to be exposed and removed. The extent of this removal may have a theoretical impact on delayed cranial settling and can be tailored as needed. The dens has been entirely removed. The cruciform ligament has transverse and vertical parts that form a cross behind the dens. The cranial extension of the vertical part is attached to the upper surface of the clivus between the apical ligaments of the dens and the tectorial membrane. The lower band is attached to the posterior surface of the body of the axis. The transverse part, called the transverse ligament, is one of the most importat ligaments of the body. It is a thick strong band that arches across the ring of the atlas. The neck of the dens in constricted where it is embraced posteriorly by the transverse ligament. The biomechanical role of the cruciform ligament is to limit the anterior movementof the atlas on the axis, preventing anterior translation and flexion. 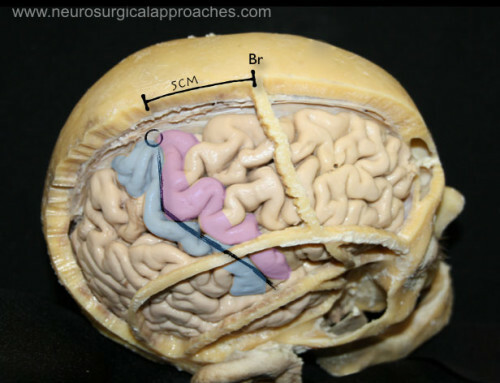 The alar ligamnets are two strong bands that ariseon each side of the upper part of the dens and extended obliquely superolateral to attach to the medial surfaces of the occipital. Their function is to limit axial rotation between the atlas and the skull. The anterior surface of the medulla is formed by the medullary pyramids, which face the clivus, the anterior edge of the foramen magnum and the rostral part of the odontoid process. The accesory nerve is the only cranial nerve thar passes through the formen magnun. It has a cranial part composed of the rootlets that arise from the medulla and join the vagus nerve, and a spinal portion formed by the union of a series of rootlets that arise from the lower medulla and the upper spinal cord. The lowest level of origin of the rootlets contributing to the accessory nerves is at the C7 root level. The hypoglossal nerve arises along the front of the inferior olive as a series of rootlets that converge on the dural orifice of the hypoglossal canal. The mayor artery related with the craneo-cervical junction is the vertebral artery. The paried vertebral arteries pass behind the lateral masses of the axis, enter the duramather behind the occipital condyles, ascend through the foramen magnun to the front of the medulla, and join to form the basilar artery at the pontomedullary junction. Aldana PR, Naseri I, La Corte E. The naso-axial line: a new method of accurately predicting the inferior limit of the endoscopic endonasal approach to the craniovertebral junction. Neurosurgery. 2012 Dec;71 Suppl Operative:ons308-14. Fernandez-Miranda JC, Morera VA, Snyderman CH, Gardner P. Endoscopic endonasal transclival approach to the jugular tubercle. Neurosurgery. 2012 Sep;71(1 Suppl Operative):146-58; discussion 158-9. Kassam AB, Snyderman C, Gardner P, Carrau R, Spiro R. The expanded endonasal approach: a fully endoscopic transnasal approach and resection of theodontoid process: technical case report. Neurosurgery. 2005 Jul;57(1 Suppl):E213; discussion E213. Messina A, Bruno MC, Decq P, Coste A, Cavallo LM, de Divittis E, Cappabianca P. Pure endoscopic endonasal odontoidectomy: anatomical study. Neurosurg Rev. 2007 Jul;30(3):189-94; discussion 194. Epub 2007 May 10. Morera VA, Fernandez-Miranda JC, Prevedello DM, Madhok R, Barges-Coll J, Gardner P, Carrau R, Snyderman CH, Rhoton AL Jr, Kassam AB. Far-medial” expanded endonasal approach to the inferior third of the clivus: the transcondylar and transjugular tubercle approaches. Neurosurgery. 2010 Jun;66(6 Suppl Operative):211-9; discussion 219-20. Rhoton AL Jr.The anterior and middle cranial base. Department of Neurological Surgery, University of Florida, McKnight Brain. Neurosurgery. 2002 Oct;51(4 Suppl):S273-302. Thanks to Wendy Fellows, laboratory assistant of the Surgical Neuroanatomy Laboratory at the University of Pittsburgh School of Medicine (Pittsburgh, Pennsylvania, US), for providing the cadaveric specimenes.